Within the body of Christ, there are many Christians who have spouses who are non-believers, but they don't know what to do in order to rectify this problem and how to do it according to the Word of God. They don't always conduct themselves in the manner a child of God should on a daily basis, or say the right things, or respond with the right attitude toward their spouse and everyone else. They haven't lived the life before their spouse, and because of this they miss the mark time and time again. 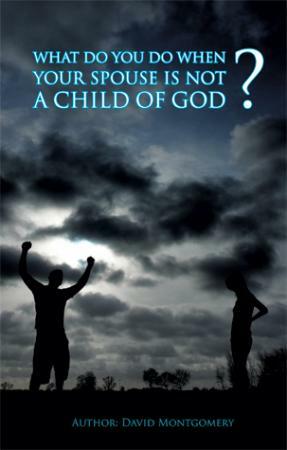 That is why Xulon Press author David Montgomery penned What Do You Do When Your Spouse Is Not a Child of God? ($14.99, paperback, 978-1-61579-360-0) a new title that will equip these believers with the tools necessary to provide a godly example to their spouses and those around them. "I hope the readers will gain an understanding of how to apply what they have learned in the book," the author says. "I hope when all hell is breaking out all around them, they will not have to ask the question 'What do I do?' because they will have a how-to do book that they can refer back to." Montgomery, who says his book is Holy Spirit-inspired, lived the experience he talks about in his book for 12 years. "I didn't live my life before my spouse and children the way God said I should in accordance with His Word," he explains. After not knowing what to do for 12 years, God brought him to an understanding of the need to exemplify godly behavior before one's spouse--and now, the author hopes to share his knowledge with others who are searching for answers. Xulon Press, a division of Salem Communications, is the world's largest Christian publisher, with more than 7,000 titles published to date. Retailers may order What Do You Do When Your Spouse Is Not a Child of God? through Ingram Book Company and/or Spring Arbor Book Distributors. What Do You Do When Your Spouse Is Not a Child of God? is available online through xulonpress.com/bookstore, amazon.com, and barnesandnoble.com. What Do You Do When Your Spouse Is Not a Child of God?